Plutonium (chemical symbol Pu, atomic number 94) is a radioactive, metallic chemical element that is part of the actinide series. It is the element used in most modern nuclear weapons. The most important isotope of plutonium is 239Pu, with a half-life of 24,110 years. It can be made from natural uranium and is fissile, meaning it can readily break apart to become lighter elements. The most stable isotope is 244Pu, with a half-life of about 80 million years, long enough to be found in extremely small quantities in nature. In fact, 244Pu is the heaviest atom naturally occurring in traces in the Earth's crust. While almost all plutonium is manufactured synthetically, extremely tiny trace amounts are found naturally in uranium ores. These come about by a process of neutron capture by 238U nuclei, initially forming 239U; two subsequent beta decays then form 239Pu (with a 239Np intermediary), which has a half-life of 24,110 years. This is also the process used to manufacture 239Pu in nuclear reactors. Some traces of 244Pu remain from the birth of the solar system from the waste of supernovae, because its half-life of 80 million years is fairly long. A relatively high concentration of plutonium was discovered at the natural nuclear fission reactor in Oklo, Gabon in 1972. Since 1945, approximately 7700 kg has been released onto Earth through nuclear explosions. 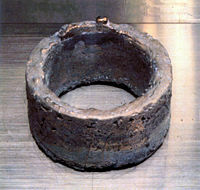 A 5.3-kilogram ring of weapons-grade, electrorefined plutonium, at 99.96 percent purity. This amount of plutonium is sufficient for use in a modern nuclear weapon. There are small amounts of Pu-238 in the plutonium of usual plutonium-producing reactors. However, isotopic separation would be quite expensive compared to another method: when a U-235 atom captures a neutron, it is converted to an excited state of U-236. Some of the excited U-236 nuclei undergo fission, but some decay to the ground state of U-236 by emitting gamma radiation. Further neutron capture creates U-237 which has a half-life of 7 days and thus quickly decays to Np-237. Since nearly all neptunium is produced in this way or consists of isotopes which decay quickly, one gets nearly pure Np-237 by chemical separation of neptunium. After this chemical separation, Np-237 is again irradiated by reactor neutrons to be converted to Np-238 which decays to Pu-238 with a half-life of 2 days. 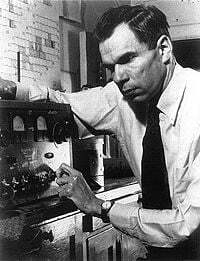 Glenn Seaborg at the Geiger Counter, 301 Gilman Hall, Berkeley, California, where he discovered plutonium. The production of plutonium and neptunium by bombarding uranium-238 with neutrons was predicted in 1940 by two teams working independently: Edwin M. McMillan and Philip Abelson at Berkeley Radiation Laboratory at the University of Berkeley, California and by Egon Bretscher and Norman Feather at the Cavendish Laboratory at University of Cambridge. Coincidentally both teams proposed the same names to follow on from uranium, like the sequence of the outer planets. Plutonium was first produced and isolated on February 23, 1941 by Dr. Glenn T. Seaborg, Dr. Michael Cefola, Edwin M. McMillan, J. W. Kennedy, and A. C. Wahl by deuteron bombardment of uranium in the 60-inch cyclotron at Berkeley. The discovery was kept secret due to the war. It was named after Pluto, having been discovered directly after neptunium (which itself was one higher on the periodic table than uranium), by analogy to solar system planet order as Pluto was considered to be a planet at the time (though technically it should have been "plutium," Seaborg said that he did not think it sounded as good as "plutonium"). Seaborg chose the letters "Pu" as a joke, which passed without notice into the periodic table. Originally, Seaborg and others thought about naming the element "ultinium" or "extremium" because they believed at the time that they had found the last possible element on the periodic table. Chemists at the University of Chicago began to study the newly manufactured radioactive element. The George Herbert Jones Laboratory at the university was the site where, for the first time, a trace quantity of this new element was isolated and measured in September 1942. This procedure enabled chemists to determine the new element's atomic weight. Room 405 of the building was named a National Historic Landmark in May 1967. During the Manhattan Project, the first production reactor was built at the Oak Ridge, Tennessee, site that later became Oak Ridge National Laboratory. 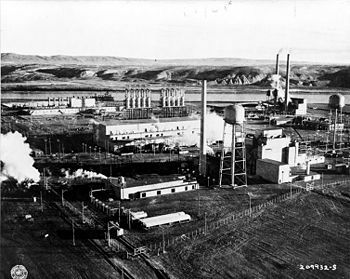 Later, large reactors were set up in Hanford, Washington, for the production of plutonium, which was used in the first atomic bomb used at the "Trinity" test at White Sands, New Mexico in July 1945. Plutonium was also used in the "Fat Man" bomb dropped on Nagasaki, Japan in August 1945. The "Little Boy" bomb dropped on Hiroshima utilized uranium-235, not plutonium. Large stockpiles of plutonium were built up by both the Soviet Union and the United States during the Cold War—it was estimated that 300,000 kg of plutonium had been accumulated by 1982. Since the end of the Cold War, these stockpiles have become a focus of nuclear proliferation concerns. In 2002, the U.S. Department of Energy took possession of 34 metric tons of excess weapons-grade plutonium stockpiles from the U.S. Department of Defense, and, as of early 2003, was considering converting several nuclear power plants in the United States from enriched uranium fuel to MOX fuel as a means of disposing of plutonium stocks. Hanford Site plutonium production reactors along the Columbia River during the Manhattan Project. During the initial years after the discovery of plutonium, when its biological and physical properties were very poorly understood, a series of human radiation experiments were performed by the U.S. government and by private organizations acting on its behalf. During and after the end of World War II, scientists working on the Manhattan Project and other nuclear weapons research projects conducted studies of the effects of plutonium on laboratory animals and human subjects. In the case of human subjects, this involved injecting solutions containing (typically) five micrograms of plutonium into hospital patients thought to be either terminally ill, or to have a life expectancy of less than ten years either due to age or chronic disease condition. These eighteen injections were made without the informed consent of those patients and were not done with the belief that the injections would heal their conditions. Rather, they were used to develop diagnostic tools for determining the uptake of plutonium in the body for use in developing safety standards for people working with plutonium during the course of developing nuclear weapons. The episode is now considered to be a serious breach of medical ethics and of the Hippocratic Oath, and has been sharply criticized as failing "both the test of our national values and the test of humanity." More sympathetic commentators have noted that while it was definitely a breach in trust and ethics, "the effects of the plutonium injections were not as damaging to the subjects as the early news stories painted, nor were they so inconsequential as many scientists, then and now, believe." Plutonium is an inner transition metal of the actinide series, located in period 7 of the periodic table, between neptunium and americium. It has been called "the most complex metal" and "a physicist's dream but an engineer's nightmare" for its peculiar physical and chemical properties. It has six allotropes normally and a seventh under pressure, all of which have very similar energy levels but with significantly varying densities, making it very sensitive to changes in temperature, pressure, or chemistry, and allowing for dramatic volume changes following phase transitions (in nuclear applications, it is usually alloyed with small amounts of gallium, which stabilizes it in the delta-phase.) Plutonium is silvery in pure form, but has a yellow tarnish when oxidized. It is also notable in that it possesses a low-symmetry structure causing it to become progressively more brittle over time. Because it self-irradiates, it ages both from the outside-in and the inside-out. However, self-irradiation can also lead to annealing, which counteracts some of the aging effects. In general, the precise aging properties of plutonium are very complex and poorly understood, greatly complicating efforts to predict future reliability of weapons components. PuVII, as PuO52- (dark red); the heptavalent ion is rare and prepared only under extreme oxidizing conditions. The actual color shown by Pu solutions depends on both the oxidation state and the nature of the acid anion, which influences the degree of complexing of the Pu species by the acid anion. Even at ambient pressure, plutonium occurs in a variety of allotropes. These allotropes differ widely in crystal structure and density; the α and δ allotropes differ in density by more than 25% at constant pressure. The presence of these many allotropes makes machining plutonium very difficult, as it changes state very readily. The reasons for the complicated phase diagram are not entirely understood; recent research has focused on constructing accurate computer models of the phase transitions. In weapons applications, plutonium is often alloyed with another metal (e.g., delta phase with a small percentage of gallium) to increase phase stability and thereby enhance workability and ease of handling. Interestingly, in fission weapons, the explosive shock waves used to compress a plutonium core will also cause a transition from the usual delta phase plutonium to the denser alpha phase, significantly helping to achieve supercriticality. Twenty-one plutonium radioisotopes have been characterized. The most stable are Pu-244, with a half-life of 80.8 million years, Pu-242, with a half-life of 373,300 years, and Pu-239, with a half-life of 24,110 years. All of the remaining radioactive isotopes have half-lives that are less than 7,000 years. This element also has eight meta states, though none are very stable (all have half-lives less than one second). 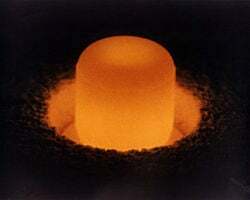 A pellet of plutonium-238, glowing under its own light, used for radioisotope thermoelectric generators. Key isotopes for applications are Pu-239, which is suitable for use in nuclear weapons and nuclear reactors, and Pu-238, which is suitable for use in radioisotope thermoelectric generators; see above for more details. The isotope Pu-240 undergoes spontaneous fission very readily, and is produced when Pu-239 is exposed to neutrons. The presence of Pu-240 in a material limits its nuclear bomb potential since it emits neutrons randomly, increasing the difficulty of initiating accurately the chain reaction at the desired instant and thus reducing the bomb's reliability and power. Plutonium consisting of more than about 90 percent Pu-239 is called weapon-grade plutonium; plutonium obtained from commercial reactors generally contains at least 20 percent Pu-240 and is called reactor-grade plutonium. Although Pu-240 is of little importance by itself, it plays a crucial role as a contaminant in plutonium used in nuclear weapons. It spontaneously fissions at a high rate, and as a 1% impurity in Pu-239 will lead to unacceptably early initiation of a fission chain reaction in gun-type atomic weapons, blowing the weapon apart before much of its material can fission. Pu-240 contamination is the reason plutonium weapons must use an implosion design. A theoretical 100 percent pure Pu-239 weapon could be constructed as a gun type device, but achieving this level of purity is prohibitively difficult. Pu-240 contamination has proven a mixed blessing to weapons designers. While it created delays and headaches during the Manhattan Project because of the need to develop implosion technology, those very same difficulties are currently a barrier to nuclear proliferation. Implosion devices are also inherently more efficient and less prone toward accidental detonation than are gun-type weapons. Image showing colors of various oxidation states of Pu in solution on the left and colors of only one Pu oxidation state (IV) on the right in solutions containing different anions. Plutonium reacts readily with oxygen, forming PuO and PuO2, as well as intermediate oxides. It reacts with the halides, giving rise to compounds such as PuX3 where X can be F, Cl, Br or I; PuF4 and PuF6 are also seen. The following oxyhalides are observed: PuOCl, PuOBr and PuOI. It will react with carbon to form PuC, nitrogen to form PuN, and silicon to form PuSi2. Like other actinides, plutonium readily forms a dioxide plutonyl core (PuO2). In the environment, this plutonyl core readily complexes with carbonate as well as other oxygen moieties (OH-, NO2-, NO3-, and SO4-2) to form charged complexes which can be readily mobile with low affinities to soil. PuO2 formed from neutralizing highly acidic nitric acid solutions tends to form polymeric PuO2 which is resistant to complexation. Plutonium also readily shifts valences between the +3, +4, +5 and +6 states. It is common for some fraction of plutonium in solution to exist in all of these states in equilibrium. The isotope 239Pu is a key fissile component in nuclear weapons, due to its ease of fissioning and availability. The critical mass for a sphere of plutonium without a tamper reflector is 16 kg, but through the use of a neutron-reflecting tamper the pit of plutonium in a fission bomb is reduced to 10 kg, which is a sphere with a diameter of 10 cm. The Manhattan Project "Fat Man" type plutonium bombs, using explosive compression of Pu to significantly higher densities than normal, were able to function with plutonium cores of only 6.2 kg. Complete detonation of plutonium will produce an explosion equivalent to the explosion of 20 kilotons of trinitrotoluene (TNT) per kilogram. However, complete detonation requires an additional neutron source (often from a small amount of fusion fuel), and primitive bombs may be far less efficient. For example, despite the 6.2 kg of plutonium, the Fat Man yield was only 21 kt. Plutonium could also be used to manufacture radiological weapons or as a radiologic poison. In a number of instances damaged nuclear weapons have spread plutonium over a surrounding area, similar to the effect of a so-called "dirty bomb," and required extensive cleanup. On the other hand, 5 kg of plutonium was spread over the Nagasaki area (due to incomplete fission) and never cleaned up. The toxicity of plutonium is in dispute; nuclear industry advocates point to the low chemical toxicity of plutonium and ability of a worker to hold a kilogram brick of the material without protection; if inhaled or digested, however, plutonium's effects due to radioactivity overwhelm the effects of plutonium's chemical interactions with the body, and the LD50 dose for intravenous injection in an adult human weighing 70 kilograms is calculated to be approximately 22 milligrams (based on extrapolation from tests on dogs). The insistence on both sides of the issue of plutonium's safety/deadliness casts questions on the current habitability of areas that have been exposed to nuclear warfare and on the health of the current residents. The plutonium isotope 238Pu is an alpha emitter with a half-life of 87 years. These characteristics make it well suited for electrical power generation for devices which must function without direct maintenance for timescales approximating a human lifetime. It is therefore used in radioisotope thermoelectric generators such as those powering the Cassini and New Horizons (Pluto) space probes; earlier versions of the same technology powered seismic experiments on the Apollo Moon missions. 238Pu has been used successfully to power artificial heart pacemakers, to reduce the risk of repeated surgery. It has been largely replaced by Lithium based primary cells, but as of 2003 there were somewhere between 50 and 100 plutonium-powered pacemakers still implanted and functioning in living patients. All isotopes and compounds of plutonium are toxic and radioactive. Although media reports occasionally describe plutonium as "the most toxic substance known to man," from the standpoint of literal toxicity this is incorrect. As of 2006, there has yet to be a single human death officially attributed to exposure to plutonium itself (with the exception of plutonium-related criticality accidents). Naturally occurring radium is about 200 times more radiotoxic than plutonium, and some organic toxins like botulin toxin are still more toxic. Botulin toxin, in particular, has a lethal dose of 300 pg per kg of body weight, far less than the quantity of plutonium that poses a significant cancer risk. In addition, beta and gamma emitters (including the carbon-14 and potassium-40 in nearly all food) can cause cancer on casual contact, which alpha emitters cannot. When taken in by mouth, plutonium is less poisonous (except for risk of causing cancer) than several common substances including caffeine, acetaminophen, some vitamins, pseudoephedrine, and any number of plants and fungi. It is perhaps somewhat more poisonous than pure ethanol, but less so than tobacco; and many illegal drugs. From a purely chemical standpoint, it is about as poisonous as lead and other heavy metals. Not surprisingly, it has a metallic taste. 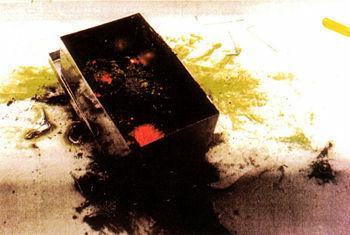 Glowing hot bits of plutonium in a box, which have been set alight due to plutonium's pyrophoric nature. That said, there is no doubt that plutonium may be extremely dangerous when handled incorrectly. The alpha radiation it emits does not penetrate the skin, but can irradiate internal organs when plutonium is inhaled or ingested. Particularly at risk are the skeleton, where it is likely to be absorbed by the bone surface, and the liver, where it will likely collect and become concentrated. Approximately 0.008 microcuries absorbed in bone marrow is the maximum withstandable dose. Anything more is considered toxic. Extremely fine particles of plutonium (on the order of micrograms) can cause lung cancer if inhaled. Other substances—-including ricin, tetrodotoxin, botulinum toxin, and tetanus toxin-—are fatal in doses of (sometimes far) under one milligram, and others (the nerve agents, the amanita toxin) are in the range of a few milligrams. As such, plutonium is not unusual in terms of toxicity, even by inhalation. In addition, those substances are fatal in hours to days, whereas plutonium (and other cancer-causing radioactive agents) give an increased chance of illness decades in the future. Considerably larger amounts may cause acute radiation poisoning and death if ingested or inhaled. So far, however, no human is known to have died immediately died after inhaling or ingesting plutonium, and many people have measurable amounts of plutonium in their bodies. In contrast to naturally occurring radioisotopes such as radium or C-14, plutonium was manufactured, concentrated, and isolated in large amounts (hundreds of metric tons) during the Cold War for weapons production. These stockpiles, whether or not in weapons form, pose a significant problem because, unlike chemical or biological agents, no chemical process can destroy them. One proposal to dispose of surplus weapons-grade plutonium is to mix it with highly radioactive isotopes (e.g., spent reactor fuel) to deter handling by potential thieves or terrorists. Another is to mix it with uranium and use it to fuel nuclear power reactors (the mixed oxide or MOX approach). This would not only fission (and thereby destroy) much of the Pu-239, but also transmute a significant fraction of the remainder into Pu-240 and heavier isotopes that would make the resulting mixture useless for nuclear weapons. Toxicity issues aside, care must be taken to avoid the accumulation of amounts of plutonium which approach critical mass, particularly because plutonium's critical mass is only a third of that of uranium-235's. Despite not being confined by external pressure as is required for a nuclear weapon, it will nevertheless heat itself and break whatever confining environment it is in. Shape is relevant; compact shapes such as spheres are to be avoided. 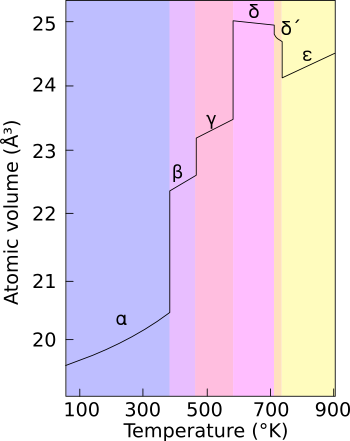 Plutonium in solution is more likely to form a critical mass than the solid form (due to moderation by the hydrogen in water). A weapon-scale nuclear explosion cannot occur accidentally, since it requires a greatly supercritical mass in order to explode rather than simply melt or fragment. However, a marginally critical mass will cause a lethal dose of radiation and has in fact done so in the past on several occasions. Criticality accidents have occurred in the past, some of them with lethal consequences. Careless handling of tungsten carbide bricks around a 6.2 kg plutonium sphere resulted in a lethal dose of radiation at Los Alamos on August 21, 1945, when scientist Harry K. Daghlian, Jr. received a dose estimated to be 510 rems (5.1 Sv) and died four weeks later. Nine months later, another Los Alamos scientist, Louis Slotin, died from a similar accident involving a beryllium reflector and the exact same plutonium core (the so-called "demon core") that had previously claimed the life of Daghlian. These incidents were fictionalized in the 1989 film Fat Man and Little Boy. In 1958, during a process of purifying plutonium at Los Alamos, a critical mass was formed in a mixing vessel, which resulted in the death of a crane operator. Other accidents of this sort have occurred in the Soviet Union, Japan, and many other countries. (See List of nuclear accidents.) The 1986 Chernobyl accident caused a major release of plutonium. Metallic plutonium is also a fire hazard, especially if the material is finely divided. It reacts chemically with oxygen and water which may result in an accumulation of plutonium hydride, a pyrophoric substance; that is, a material that will ignite in air at room temperature. Plutonium expands considerably in size as it oxidizes and thus may break its container. The radioactivity of the burning material is an additional hazard. Magnesium oxide sand is the most effective material for extinguishing a plutonium fire. It cools the burning material, acting as a heat sink, and also blocks off oxygen. There was a major plutonium-initiated fire at the Rocky Flats Plant near Boulder, Colorado in 1957. To avoid these problems, special precautions are necessary to store or handle plutonium in any form; generally a dry inert atmosphere is required. ↑ As one article puts it, referring to information Seaborg gave in a talk: "The obvious choice for the symbol would have been Pl, but facetiously, Seaborg suggested Pu, like the words a child would exclaim, 'Pee-yoo!' when smelling something bad. Seaborg thought that he would receive a great deal of flak over that suggestion, but the naming committee accepted the symbol without a word." David L. Clark and David E. Hobart, "Reflections on the Legacy of a Legend: Glenn T. Seaborg, 1912-1999," Los Alamos Science 26 (2000): 56-61, on 57. Retrieved March 20, 2007. ↑ Frontline interview with Seaborg "Nuclear Reaction: Why do American Fear Nuclear Power?" PBS. Retrieved March 20, 2007. ↑ National Historic Landmarks Program: Room 405, George Herbert Jones Laboratory National Park Service. Retrieved March 20, 2007. ↑ William Moss and Roger Eckhardt, "The Human Plutonium Injection Experiments," Los Alamos Science (1995). Retrieved March 20, 2007. ↑ Michael S. Yesley, "'Ethical Harm' and the Plutonium Injection Experiments," Los Alamos Science 23 (1995): 280-283, on 283. Retrieved March 26, 2015. ↑ "Plutonium: An element at odds with itself," Los Alamos Science 26 (2000): 16. Retrieved March 20, 2007. ↑ 8.0 8.1 Siegfried S. Hecker, "Plutonium and Its Alloys: From atoms to microstructure," Los Alamos Science 26 (2000): 290-335. Retrieved March 20, 2007. ↑ Anne Stark, 2006. "Scientists tackle long-standing questions about plutonium" Lawrence Livermore National Laboratory. Retrieved March 26, 2015. ↑ William J. Crooks III, Nuclear Criticality Safety Engineering Training Module 10 - Criticality Safety in Material Processing Operations, Part 1 U.S. Department of Energy, Nuclear Criticality Safety Program. Retrieved March 20, 2007. ↑ A tamper is an optional layer of dense material (typically natural or depleted uranium or tungsten) surrounding the fissile material. It reduces the critical mass and increases the efficiency by its inertia which delays the expansion of the reacting material. ↑ Much of the information about plutonium in the Fat Man bomb comes from reports of the criticality accidents of Harry K. Daghlian, Jr. and Louis Slotin, both of whom died after conducting experiments with plutonium bomb cores. See, for instance, Los Alamos and the Omega Site Accident. Retrieved March 20, 2007. ↑ George L. Voelz and Ileana G. Buican, Plutonium and Health: How Great is the Risk? Los Alamos Science 26 (2000). Retrieved March 26, 2015. ↑ National Academy of Sciences, Committee on International Security and Arms Control, Management and Disposition of Excess Weapons Plutonium (National Academy Press, 1994). Retrieved March 20, 2007. ↑ David Albright and Kevin O'Neill, "The Lessons of Nuclear Secrecy at Rocky Flats" U.S. Dept. of Energy Communication. Retrieved March 26, 2015. ↑ Plutonium ISIS Issue Brief. Retrieved March 26, 2015. Emsley, John. Nature's Building Blocks: An A–Z Guide to the Elements. Oxford: Oxford University Press, 2001. ISBN 0198503407. Greenwood, N.N., and A. Earnshaw. Chemistry of the Elements, 2nd ed. Oxford, UK; Burlington, MA: Butterworth-Heinemann, 1998. ISBN 0750633654. Online version. Hampel, Clifford A. The Encyclopedia of the Chemical Elements. New York: Reinhold Book Corp., 1968. ISBN 0442155980. Morss, Lester R., Norman M. Edelstein, and Jean Fuger (eds.). The Chemistry of the Actinide and Transactinide Elements, 3rd ed. 5 vols. Joseph J. Katz, adapter. Dordrecht: Springer, 2006. ISBN 1402035551. Stwertka, Albert. Guide to the Elements, Rev. ed. Oxford: Oxford University Press, 1998. ISBN 0195080831. Background Information on Plutonium Plutonium Sub-Directory, Canadian Coalition for Nuclear Responsibility. Plutonium. The University of Sheffield and WebElements Ltd. Physical, Nuclear, and Chemical Properties of Plutonium. Institute for Energy and Environmental Research. Special Weapons Primer. Plutonium Production. Federation of American Scientists. Samuels, David.End of the Plutonium Age. Discover Magazine, vol. 26, no. 11 (November, 2005). Plutonium Manufacture and Fabrication. Nuclear Weapon Archive. World Plutonium Inventories. NuclearFiles.org, Nuclear Age Peace Foundation. Los Alamos Science. Challenges in Plutonium Science. Los Alamos National Laboratory. Hazardous Substances Data Bank. Plutonium, Radioactive. TOXNET, National Library of Medicine. This page was last modified on 29 March 2019, at 21:59.